Remembering MJ : "Michael Waved Back At Me!" "Michael Waved Back At Me!" J.G is a friend of mine who lives in West London, he once told me about when Michael Jackson came to West London in the mid 1980's. It turned out that he also has a couple of interesting real life tales about Michael. J.G saw Michael on March 28, 1985, at the height of his career just after Thriller. 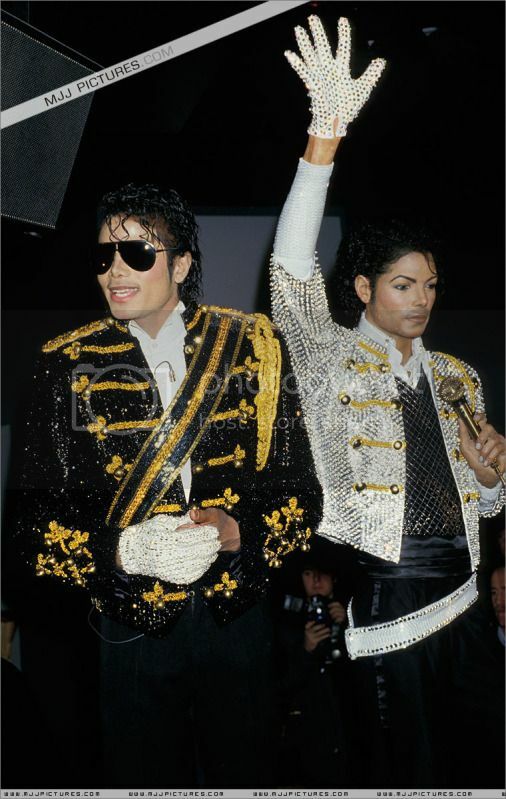 Michael was invited to unveil his wax model at Madame Tussauds in Marylebone, London. 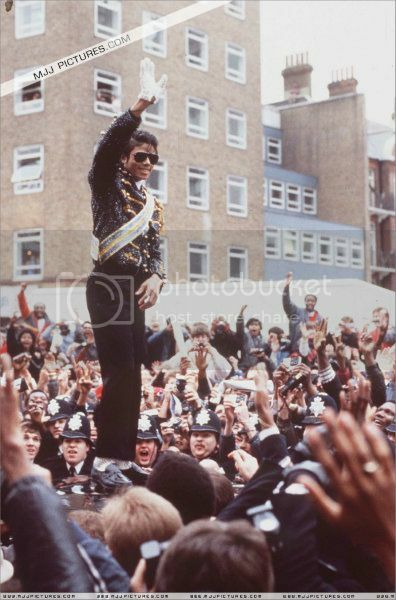 It was his first solo public visit to England since the Jackson Five tour in the late 1970's. London was brought to a standstill as thousand of fans gathered in the street near the museum hoping to get a glimpse of him. It was purely coincidental that the car Michael was traveling in got held up by traffic and stopped right in front of my friend as he was leaning against the barrier among fans in the street. It was a very brief and surreal moment as he didn't expect Michael to be so close, only two feet away from him. Michael was wearing his dark sunglasses, in black and gold glittery military jacket siting at the back of the car. J.G automatically waved excitedly at Michael, other fans started to go crazy. A rather shy Michael waved back to him and everyone else in his famous sequined white glove before moving off. As it happened so fast it was only afterwards that he realised that he had just seen Michael Jackson! He watched the news later that day featuring the footage of Michael leaping onto the roof of his car to wave to his adoring fans before leaving. He was then the super star Michael Jackson instead of a shy Michael he saw earlier that day. He indeed saw a piece of history, he also told of a friend of his (Simon) who had actually met Michael more than a decade later in an antique shop "Alfies" in Marylebone where he once worked. Michael was in his surgical mask and arrived unannounced with two bodyguards. Although Simon was used to seeing celebrities, he was totally taken by surprise. Unlike other major Hollywood stars that came to the shop, Michael appeared to be very nice and polite. Simon recalled hearing Michael speak in a deep voice, looking around the shop and enquired about items that he was interested in. Michael bought an elaborate Walt Disney's autograph valued around £600 along with some movie memorabilia which were paid for by his bodyguard. During the visit, Michael was discovered by a few local kids who excitedly tapped on the window. Michael responded to them by taking off his surgical mask and went outside to greet them. He spoke with them in a soft higher voice, happily posed for photos and gave his autographs before returning to the shop. These are now distant memories of King of Pop, Michael Jackson who will be sadly missed. Thanks to my friend J.G for sharing the stories.